Another group of All4Aid volunteers arrived in Lesbos last week. Among them a pensioner, a teacher, a house wife, a pastor. Common people from all walks of life who set aside two weeks of their busy lives to serve refugees facing very challenging conditions. One of their first tasks was to help set up tents outside Moria Camp, as there is no more space in camp and hundreds of refugees are still arriving in Lesbos each week. 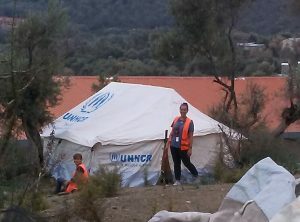 After a long day of hard work, they also helped some refugee families to move into the tents. “That made everything worth it”, one of the volunteers said. To see the joy and relief in the refugees faces for having a place to stay after such a long and risky journey, even if it is only a simple tent, is something that impresses all volunteers. If you are interested in joining a Volunteer Trip to Lesbos, click here for more information.